The Entertainment Marquee is situated within the Paddock and is open exclusively to paddock users throughout race week except Thursday evening and Saturday when it is Hospitality Package holders only. VIP Hospitality can be purchased via the buy and book section. Paddock Access passes can be purchased from the Ticket Office during race week. The marquee provides food, drink and entertainment throughout the week and children are permitted in the marquee up to 9 pm each evening. 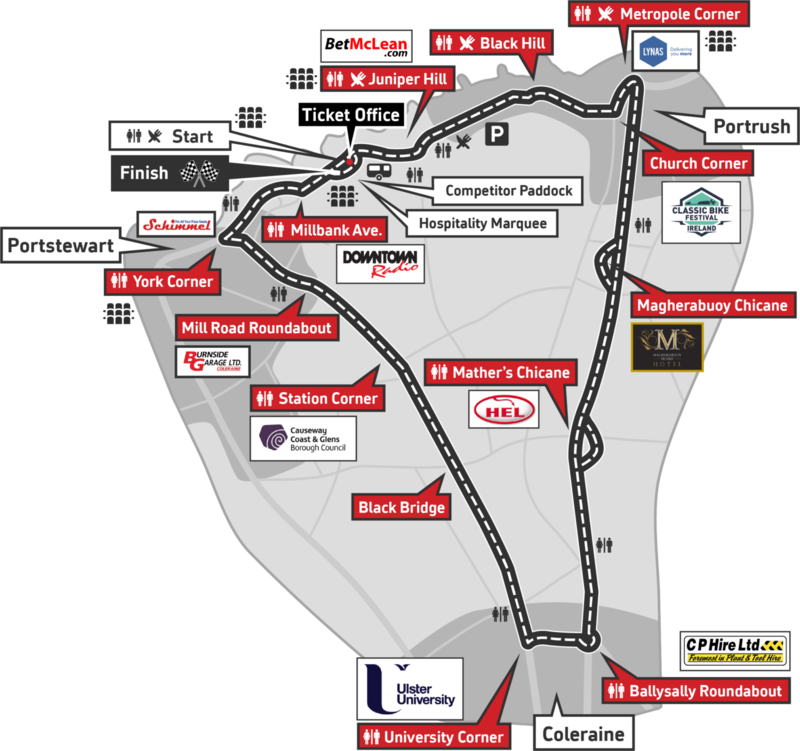 Start / Finish (including disabled toilet), Millbank, Primrose Hill, York Corner, Mill Road, Station Corner, Dundooan / University Corner, Ballysally Roundabout, Nicholl’s, Mathers Cross, Carnalridge, Magherabuoy, Hillcrest, Metropole, Black Hill, Juniper Hill (including disabled toilet), Quarry Hill, Ballyreagh. Official car parks are located beside the competitor paddock on the golf course and beside the Inn on The Coast. All car parks are displayed with official signage. We would ask that all visitors support the event by using the official car parks.